One of the more intimate resorts on Marco Island is the Marco Beach Ocean Resort and today's couple had a beautiful celebration with all the views without having to get sandy! 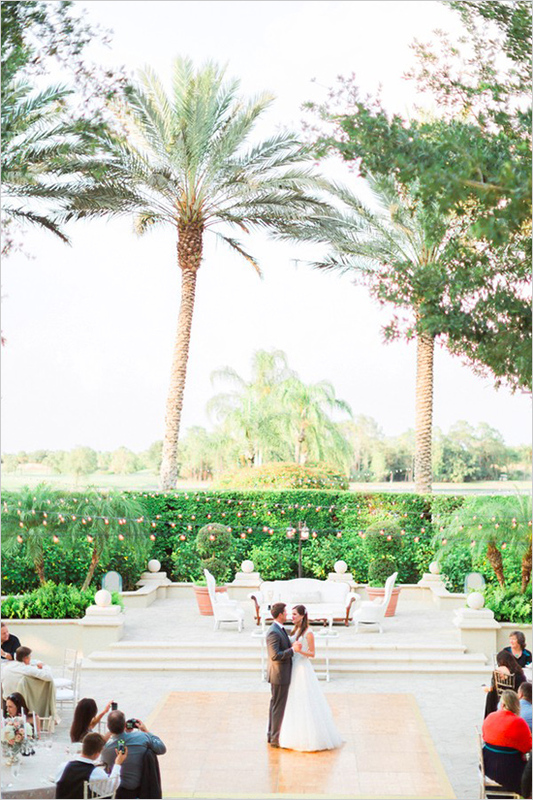 This bride and groom chose the terrace outside the ballroom at this Marco Island resort as the setting for their nuptials. 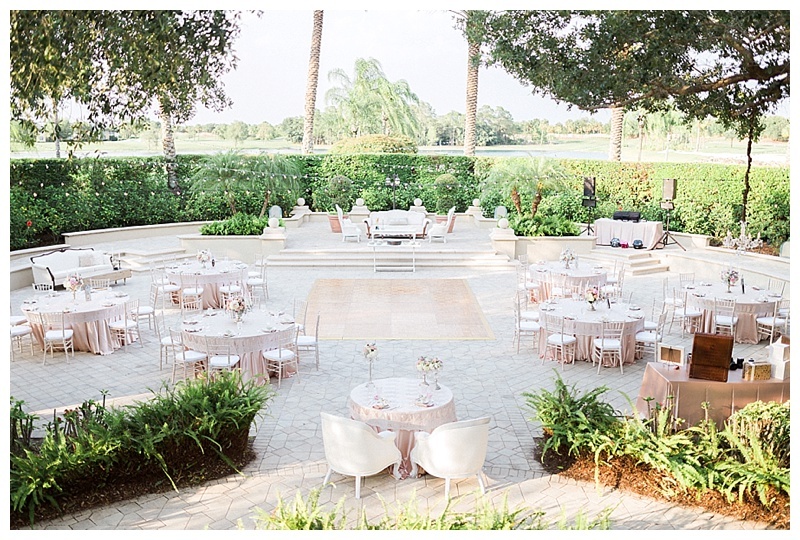 You don't really need to embellish the space too much when you have the lush tropical greenery and the Gulf of Mexico as your backdrop! They then continued their celebrations inside. 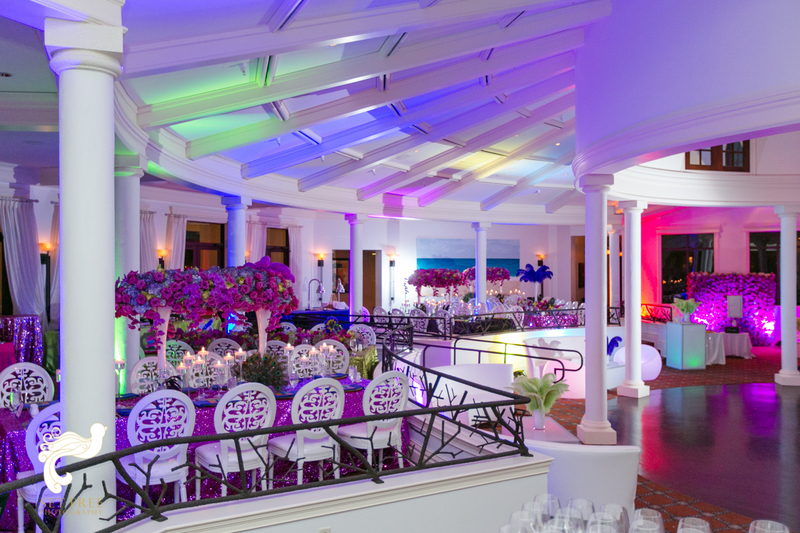 They chose lilac as their main color and accented it with vibrant shades tropical pink florals throughout the ballroom. 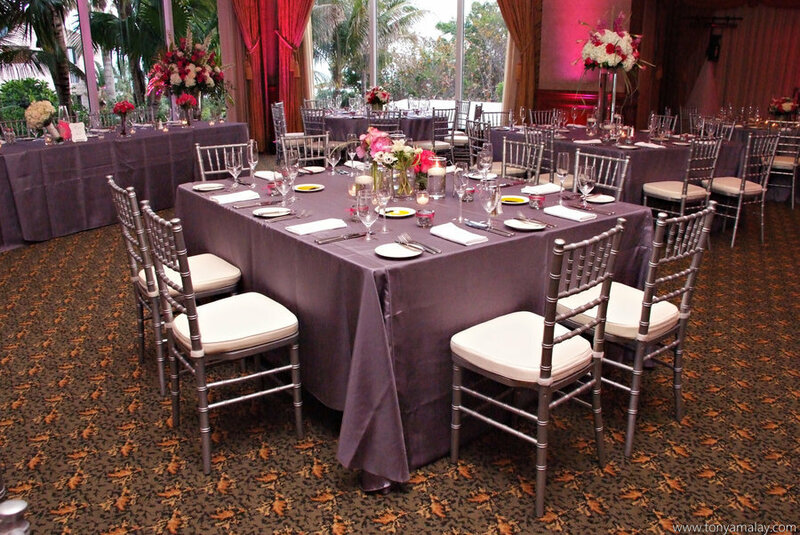 As you can see they accented all these tropical hues with our classic silver chiavari chairs. You really can not go wrong with this classic alternative, they just look SO much more elegant than the standard chairs that are typically provided at venues. 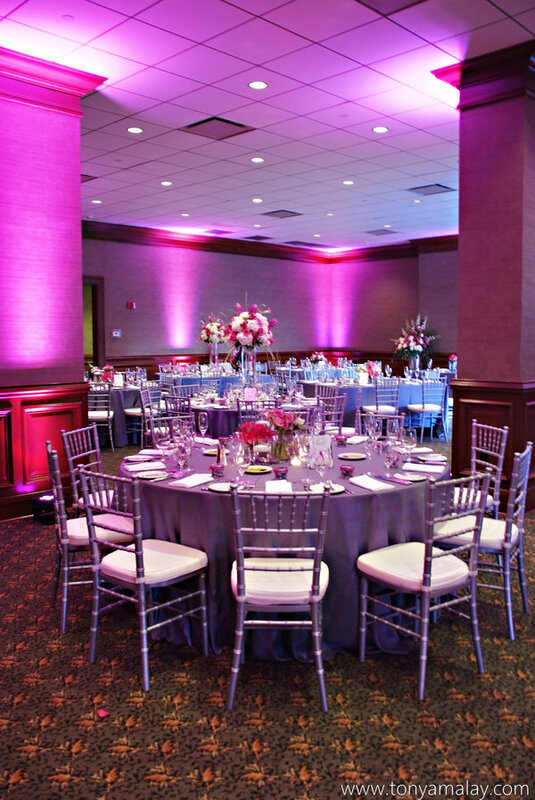 As the evening progresses, there is nothing that ads to a rooms' ambience like lighting and it is so often forgotten by couples as they plan out their wedding rentals. It gives the space a club like atmosphere and adds so much personality at such a reasonable price. 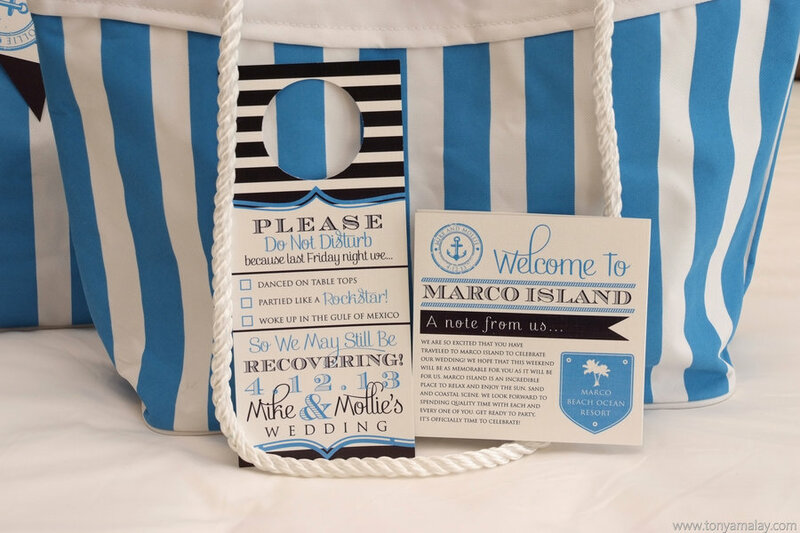 We also can't fail to mention the adorable welcome bags they had delivered to each of their guests rooms, welcoming them to their Marco Island wedding and giving them some helpful information as well as some fun essentials to help them through the weekend. These bags were custom made by our friends at Luster Designs in Naples. Feeling a bit stumped as to how you can add some personality to a space and not waste it on details that will be overlooked? We are the pros with hundreds of weddings each year, we've got plenty of experience and ideas to help you create a wedding that is just what you dreamed! Well today's post is nothing short of spectacular and this masquerade birthday party was no doubt THE PARTY of the year!! The florals and design, by Isn't She Lovely were absolutely GORGEOUS and were brilliant in rich jewel tones. The custom paper products left no detail unattended and it's no surprise since the birthday girl was none other, than Megan Miller, the owner of Luster Designs. 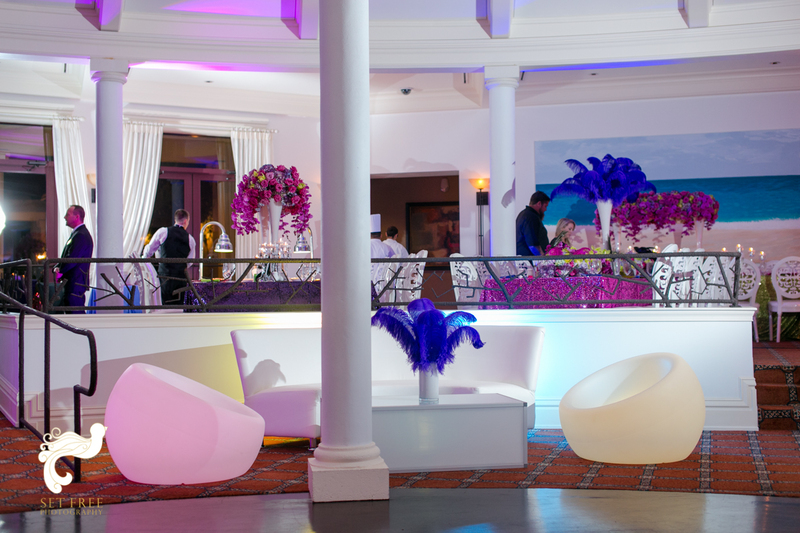 We just love how she incorporated so much of our lounge pieces throughout the space at Miromar Lakes to create one of the favorite masquerade bashes we have ever seen! 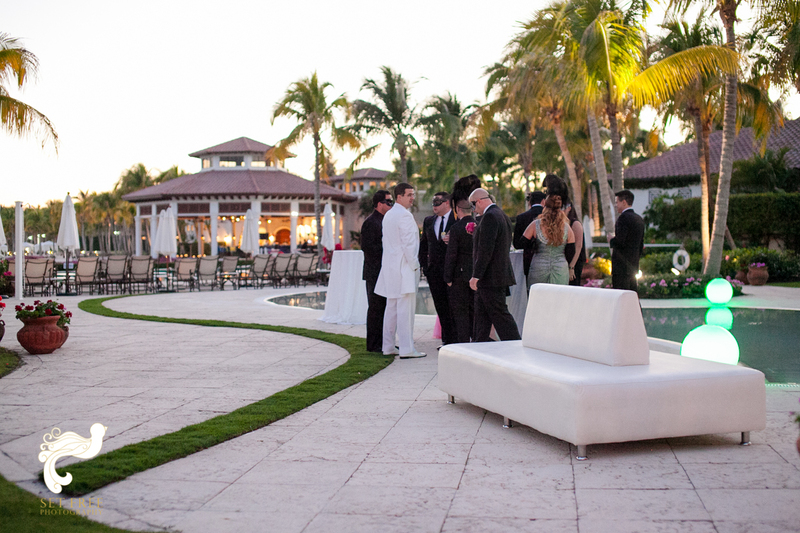 The crisp white island bench was used outdoors poolside along with our glow orbs. Then as guests transitioned inside, amidst peacock feathers and sequined tabletops our crisp white lounge furniture was a perfect compliment. 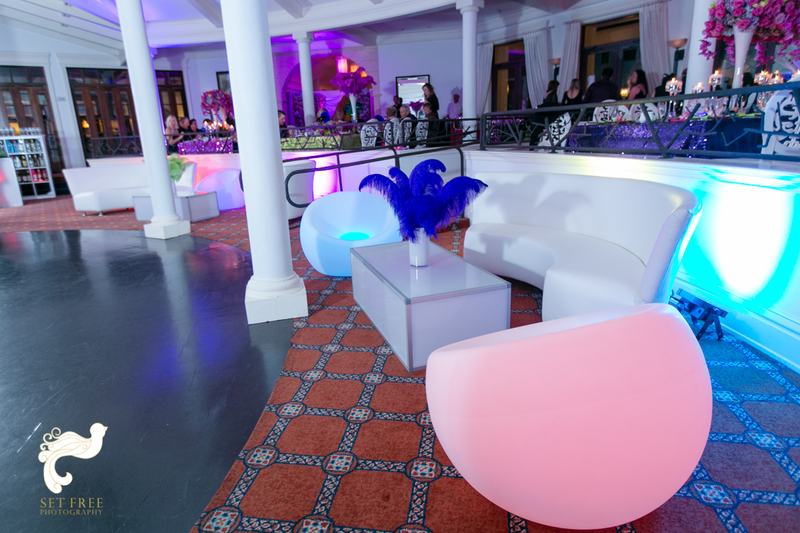 As the lights dimmed and the dance floor filled, they mixed in some of our Glow furniture rentals to give the room at Miromar Lakes a more club like feel. OK.....enough chit chat.....you can finally take a peek below!! 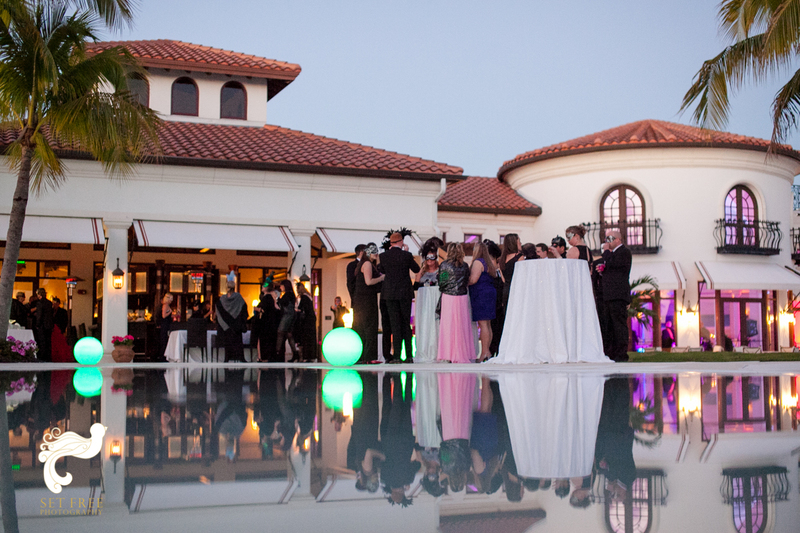 Well, the word's out.....The Club at the Strand is definitely not a secret and it's been one of the hottest wedding venues in Naples for a few years now. We are going to tell you why....are you ready????? It's that AMAZING COURTYARD!!! Today's wedding was all held outside - both the beautifully elegant, vintage inspired ceremony as well as the gorgeous reception which was right in the middle of that stunning courtyard. We kid you not, they used our classic and soft lime-washed chiavari chairs, which some people refer to as white washed. 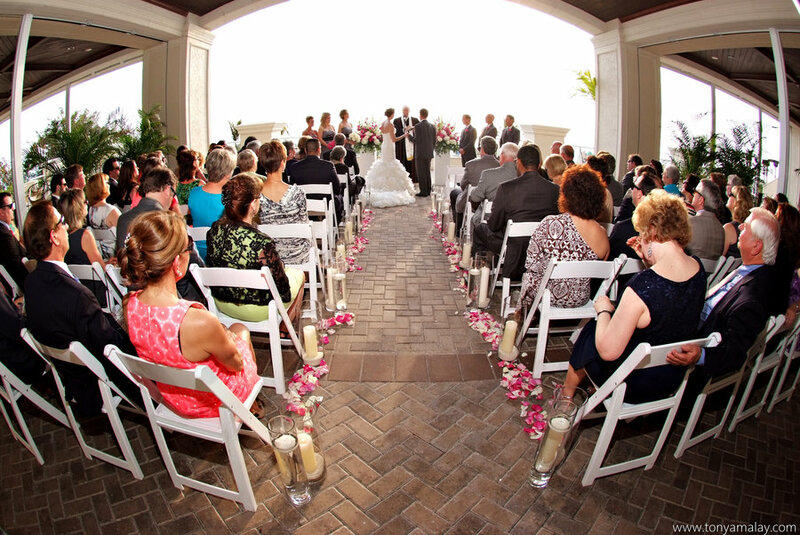 Here's some other weddings that used our lime-washed chiavari chair rentals, we think they might one of our new favs! 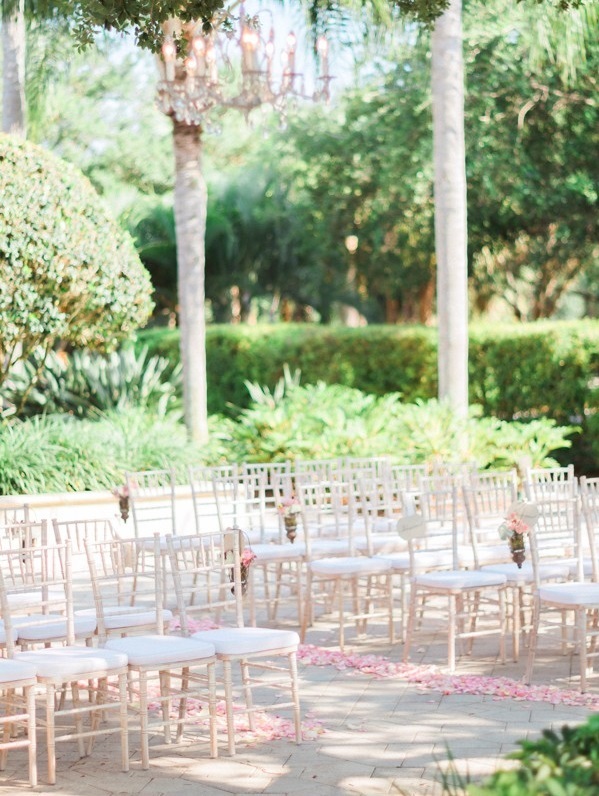 Regardless of what you call them, these chairs added to the softer vintage feel for both the ceremony and reception. 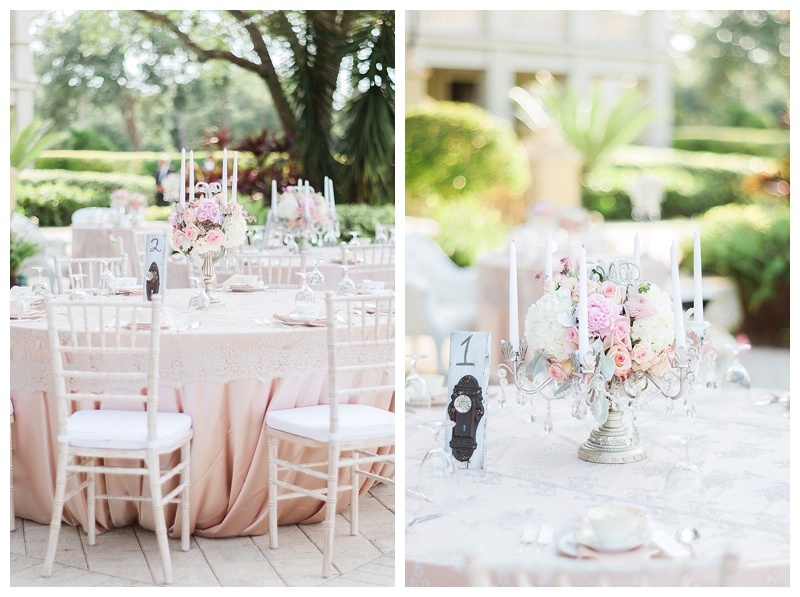 They paired them against a super soft blush linen that they accented with delicate lace. This reception was just out of a storybook!! No detail was overlooked from the vintage handkerchiefs at the ceremony to the teacups at the reception place settings. 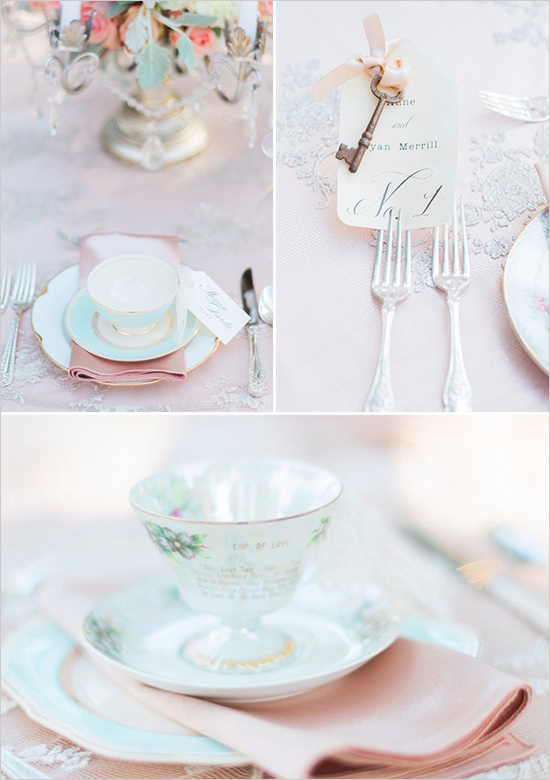 To top it all off they used the softest blush florals accented by soft grey lambs ear touches. We have enjoyed outfitting receptions like this with our dancefloors and even bistro lights overhead, so that as the evening progresses....you can create that soft glow and ambience for your celebration. We also provide foliage rentals which sometimes can be a really easy way to create smaller spaces within larger outdoor spaces, or to block off certain areas without being obvious.